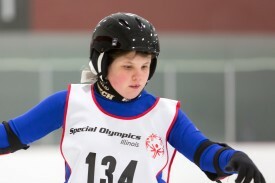 Shelby Leeper, 14, of Pekin had quite an experience at her first Special Olympics Illinois Skating Championships last year. She won three gold medals in speed skating. But that wasn’t the amazing part – she did it with a broken ankle. The 8th-grader at Georgetown Middle School began competing in Special Olympics in 2013 through Pekin Illinois River Valley Special Recreation Association (IRVSRA). In addition to speed skating, she competes in athletics, basketball, softball and teeball. Just before her last time trial last year, Shelby fell on the ice. Despite the pain in her ankle, she skated her time trial. After the race, medical personnel examined her ankle and advised that coach Barb Needham ice it to keep the swelling down. On the second day of competition, Shelby competed in the 111-meter, 222-meter and 333-meter races. “She came home limping and when she took her shoe off, the foot and ankle were all black and blue and swollen,” said Shelby’s mother, Kathy Leeper. Kathy took Shelby to the doctor the next day. After examining her X-rays, the doctor prescribed ice and ibuprofen for what he thought was a soft tissue injury, adding that he would have a radiologist look at the images. Shelby wore a cast for 8 weeks, then a removable air cast for another 7-8 weeks. That didn’t keep her from competing in sports later in the year. She competed in the softball throw at Summer Games on crutches, said Kathy. She played teeball later in the fall. In the two years that Shelby has competed in Special Olympics, Kathy has noticed that she interacts better with people and has made some real friends on the team. When it came time to get back on the ice late last year, Shelby said “I’m not scared.” Her mother added that she was a little apprehensive to get on the ice the first time, but after she was on the ice for a few minutes, she was fine. Shelby’s looking forward to this year’s Skating Championships (Feb. 18-19 at Canlan Ice Center in Romeoville) and is hoping for a repeat of last year, but only the three gold medal part.